They are sometimes called quadracycles, quadricycles, quadcycles or even four wheeled bikes. Whatever you call them they are a lot of fun and have some distinct advantages compared to bicycles and motor cars. 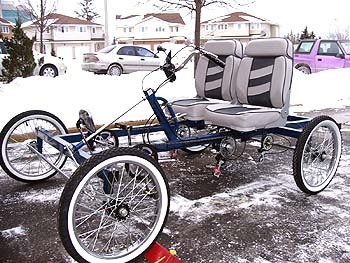 There is no other pedal-powered vehicle that can offer the advantages of side-by-side seating for two. Quadracycles are the ultimate "green" zero emissions car. They can carry similar loads to a motor car and do it quietly, without burning any gasoline and while providing some good exercise. They are more comfortable, more stable and carry a lot more than a bike. There is a comparison with these other vehicles in About Quadracycles. We have been riding bikes and trikes in Ottawa since 2001 and have greatly enjoyed our experiences on the city's great network of bike trails as well as on the streets. The Alcatel-Lucent Sunday Bikedays NCC parkway closures to motor vehicles have been wonderful experiences as we take our bikes out, along with thousands of other bike riders, skateboarders and in-line skaters in the city. The people of Ottawa love their bikes. They own and ride them in amazing numbers. 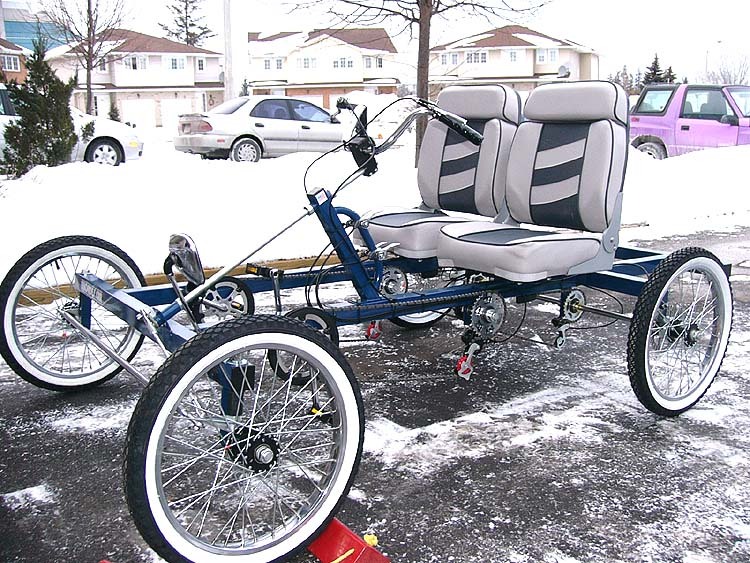 We have seen thousands of bikes, including recumbents and the occasional trike, but in all the time we have been biking in Ottawa we have never seen a four wheeled bike. That seems amazing in a bike-crazy city like Ottawa! 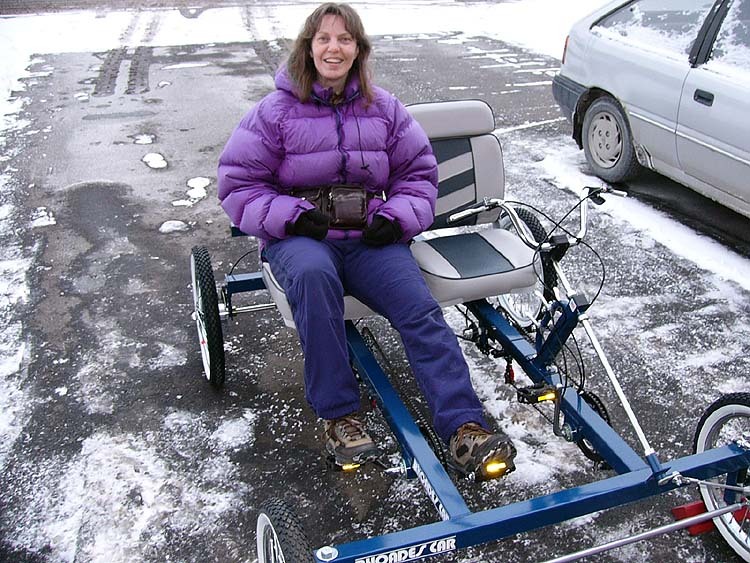 Perhaps when we took our quadracycle out on the city streets for the first time on 25 March 2007 we were the first to pedal one in this city. 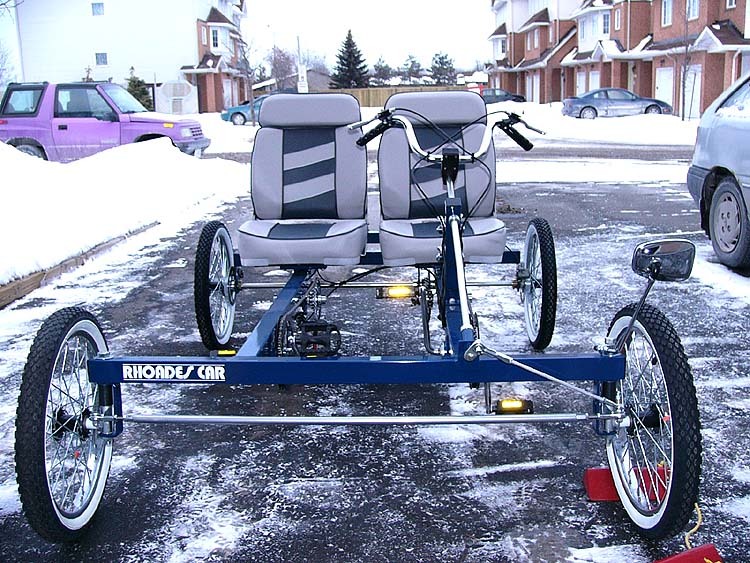 Whether this is the first quadracycle in Ottawa or not, it has been getting lots of attention from people who see us. As a result we decided to create this website to provide information about quadracycles, describe the quadracycling rules, explain how we got into it, tell our quadracycling stories in a blog and provide some quadracycle photos too. For our most recent news read the Quadracycling in Ottawa Blog. Gordon Koppang's Affordable (and Powerful) lighting for the Rhoades Car (1.4 MB).